Let this thread serve as a convenient means of communication regarding Map of the Month. I'll let you know what's going on with the contest and you can offer whatever comments, questions, and feedback you may have. This is an open topic; feel free to ask questions and leave comments! For the moment, we're totally devoid of entries for Map of the Month 61. If you can spare a minute of your time, please head over to the dropbox and send in what you've got. If all goes well, we can start Map of the Month 61 on March 1st. I'm looking forward to it as always! Alright, I'll see if I can submit something. No promises though, but hopefully I will be able to submit something! I just put a map in the Dropbox, so there's at least one entry. We've got two entries now, so we'll be ready to start sometime in the next 24 hours. Of course, more maps are always welcome. Thanks for your support. 1) Congrats to SKM 2012 for winning Map of the Month 61 with this fine map! 2) Map of the Month 62 is now open. Make sure to review the creations and cast your vote for the best. Don't forget to leave comments on maps! They help the creators improve and open a productive discourse about general design that can help us all. Plus, more comments makes the contest feel like the communal affair it should be. No comments is like hosting a Mario Party sleepover without inviting anybody. Why would you do that? We'd love to have at least two entries so we can start Map of the Month 67 on time. Unfortunately, we're at zero right now. Please send your maps in! I know you Two-Week Quest Content creators have some stuff to share, right? We'd still like two maps so we can start on time. Please send yours in! We're one map short for MotM 68... If you have a good one, please send it in! Submitted a nice mini-dungeon I made for my quest. BTW, it's a new month now, where are the screenshots? Don't worry; I haven't forgotten. I recently got a new laptop, so I'm just in the process of migrating the maps over, setting up FTP, uploading the maps, and all that fun jazz. The contest will start as soon as possible. Submitted by first entry into this contest. 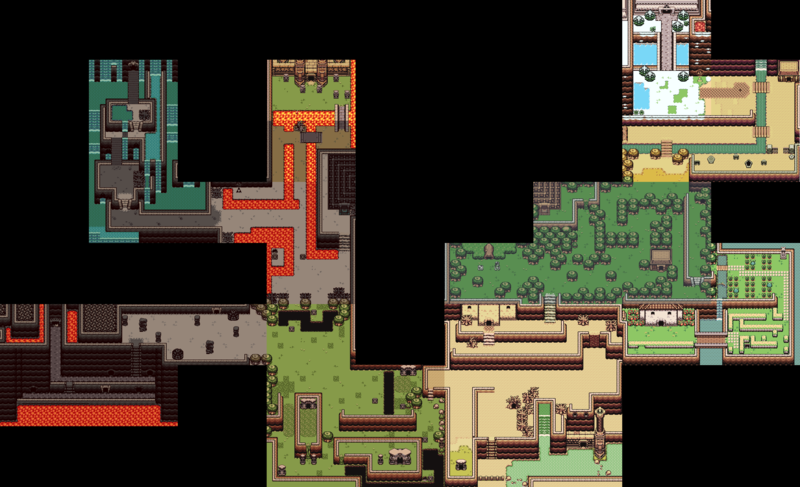 I don't know exactly what the rules are about this (couldn't find anything relevant) but I cut up the maps generated by each palette and then spliced them back together to map a complete map that reflect how things will look in the completed game. So it's still an accurate map, just not precisely the same as the one that the mapmaker function generates. If this isn't acceptable, cropping out the screens with the different palettes wouldn't be too hard, so let me know. The map you submitted is fine because it shows one continuous area. Thanks for checking.